So what colours of light should an LED grow light have? What colours of light do we get from traditional grow lighting? What else should you be looking for in an LED grow light? The research into this question has been confusing to say the least and because of this the products on the market have varying combinations of LED colours and intensities. We think this goes a long way to explaining the differing opinions and experiences people have had with respect to the effectiveness of LED grow lights on plant growth. We think we can make more sense of what makes a good LED grow light by first analysing what wavelengths plant pigments are absorbing. We debated on whether to include all the detail about plant pigments in this article but ended up deciding that for most people, the scientific information would be sleep-inducing, even though we find it quite fascinating knowing what's going on inside those leaves! So, instead we created a separate page to summarise the more scientific findings here. Suffice it to say, that so far, all the pigments identified in green plants absorb light wavelengths in the UV, blue, red and far-red regions of the light spectrum while ignoring (or avoiding!) the green and yellow regions. This makes sense from the standpoint of what we see: plants are green precisely because they don't absorb these wavelengths, instead reflecting them back at us (note: we only see the reflected yellow / orange colours in the fall when the green chlorophyll has degraded). NB: one key point to keep in mind is that plant photosensitive pigments typically absorb light over a narrow band of wavelengths around a central peak. Therefore if LED wavelengths do not exactly match the ideal wavelengths required, for instance let's say we have 650nm LEDs in our grow light instead of 660nm ones for red light, that's still OK since plants will likely absorb sufficient amounts of 650nm light to equal their 660nm light requirement, so we have some leeway. ​We've also seen some LED grow lights containing white LEDs which appear to be included in the light fixture to provide the 'other' important wavelengths in addition to the essential red and blue ones - how effective they are is debatable but there are only two common ways to generate white light from LEDs, neither of which seems to sufficiently cater to all the wavelengths that we've outlined and may even be producing lots of the undesired green/yellow light. We detail our findings on how white LEDs are made here and why we think they should NOT be in your LED grow light. 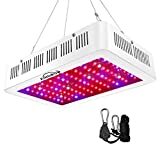 High-power LEDs - For the serious horticulturalist, we would avoid anything that is below 3-watts (just as a point of reference, the typical electronics LED is 0.02-watts or less). The current standards in LED grow lights today are 3-watt or 5-watt LEDs. However, we did notice some chatter about the current state of 5-watt LED technology being at a stage where they are still not as electrically efficient and have a shorter lifespan than 3-watt LEDs. We are not sure how true this is, but to be on the safe side, the prudent course of action is to lean towards 3-watt LEDs for the moment since they have proven their worth so far. Brand-name LEDs - It is important also for LED grow lights to only contain brand-name LEDs. This is because big-name companies extensively test their LEDs to ensure that their life expectancy is within the range that they specify. They have a reputation to uphold after all! Metal core, cooling fans and heat sink - Even though LEDs produce far less heat than other types of lighting, they still produce some heat. While this is unlikely to be detrimental to plant growth, it is detrimental to the LED lifespan. The way high-quality manufacturers have tackled this is to place each LED on a metal base attached to a heat sink providing a path for heat to escape, and complemented by the presence of electric fans. These are an absolute must for high-power LEDs. Constant-Current - Cheap LED grow lights are powered by constant voltage circuitry. As the LED’s temperature increases, its voltage tends to drop, causing a cheap LED driver to compensate by increasing the voltage it supplies, inadvertently increasing the current as well. This increased current ages the LED prematurely reducing its life expectancy. 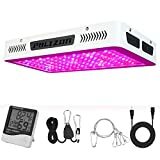 The better LED grow lights have circuitry that keeps the current steady instead of the voltage and probably gives you better value for money in the long run.